In Europe, although the upstream PX and MEG contracts for August have yet to settle, PET players have already started to paint a bearish panorama, according to ChemOrbis. July PX and MEG contracts had settled with €15/ton and €19/ton decreases from June, respectively. Looking at spot PX prices, they indicate $25/ton decreases when compared to the beginning of July, encouraging decrease expectations on the August contracts. Meanwhile, MEG supplies have been reported to be comfortable throughout July. 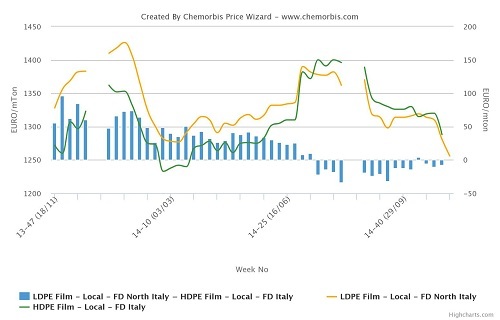 Coming back to the downstream PET market, buyers operating in Italy are closing their July PET deals with up to €60/ton decreases from June levels and continue to voice further decrease expectations. Meanwhile, a trader, who noted that their sales performed better in the second half of July when compared to the beginning of the month, noted that feedstock costs do not indicate large drops. “However, we see aggressive PET offers from Asia, given the slow market conditions in China, and that is what is really putting downward pressure on the European market. Meanwhile, apart from the beverage sector, demand is not that strong in the European markets,” he further added. Another converter noted that they have not made any fresh purchases in July as they were comfortably covered, according to ChemOrbis. However, he admitted that they might come back to the market in August to make some purchases. “Overall demand has been regular but not brilliant,” he added. A different PET bottle manufacturer reported making some import South Korean PET purchases with late September delivery. “We did not need to make any purchases from the local market during July as we were already covered. However, we anticipate further decreases in August and if we see competitive prices, we might make some purchases then,” he stated further. In Germany, a similar panorama is observed. 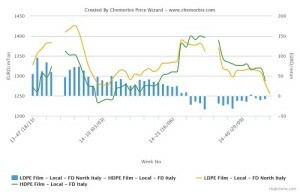 July deals are mostly wrapped up with €40-75/ton decreases from June levels while further decrease expectations, of around €30/ton, are pronounced for August as per ChemOrbis pricing service.